Ian has been wiggling a loose tooth for weeks, but the sucker stubbornly held on. It finally popped out this morning. Another milestone. Next on the chore list is to Spray and Wash the sheets to get the blood out. It looks like a crime scene in his bedroom. 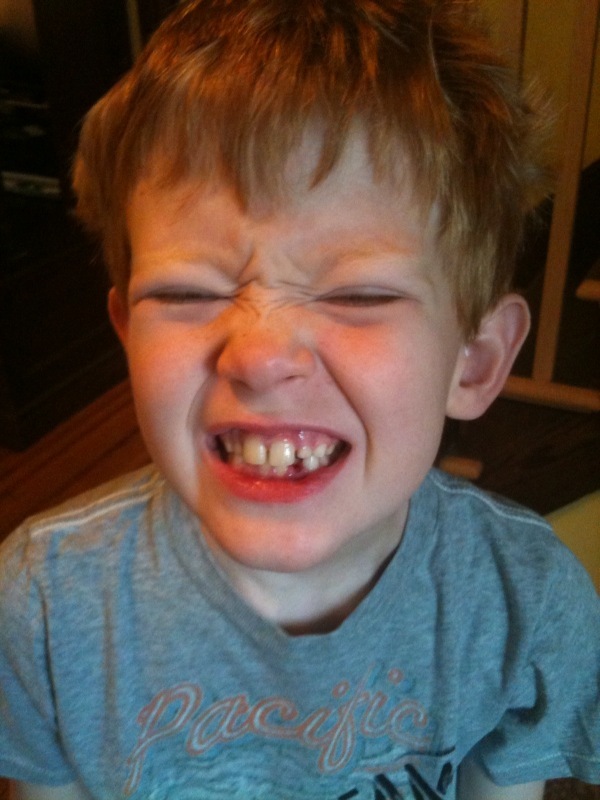 He is ridiculously happy about the tooth fairy's arrival tonight. Tonight, we'll exchange money for the tooth and then add it to the collection of body parts in the attic. I suppose one day we'll give him the box with the first haircut and the envelope of teeth. I'm sure he'll be thrilled. then add it to the collection of body parts in the attic. You have to fight clutter. Anybody body part that I haven’t worn for two seasons goes to Goodwill. What is the going rate for a tooth these days? $5. Can you believe it? The tooth fairy is high. We were clearing out my grandmother’s effects and found an envelope with hair from a great-aunt’s first haircut, in I think 1895. A nice use of teeth is to put them in a glass of coca-cola and invite the kids to watch how long they take to fully dissolve. suitable for a science fair! You know to wash the bloody sheets in cold water, right? Should come right out.